"This book is all about home: not just the houses we live in but the homes we have found for ourselves." So reads the student-written foreword of The Five Senses of Home/Los cinco sentidos de hogar, the latest book of poems and stories from the prolific 1st-8th grade students of the 826CHI After-School Tutoring & Writing program. This collection, which will be released at a community celebration at 826CHI on Thursday, April 11th from 4:30-6:30pm, broadens the definition of home. To many of these young writers, home is wherever, whomever, and whatever makes them feel safe and loved. In "Home Is" by Courtney M., grade 6, "Home is where I can recharge myself." In "What Home is to Me" by Abigail M., grade 8, "Home isn't always a place, it's a feeling—and a good one at that." Meanwhile, in "The Bright Colors" by Joseph B., grade 3, "Home is the color red." In The Five Senses of Home, home is defined as everything from homemade arroz con leche to the feeling of zen that comes from coloring. Of course, home cannot be reduced to any one feeling or thing. In many of these pieces, home summons a complex web of emotions and memories. As Diego R., grade 7, writes in "How Home Feels to Me," "Home also makes me feel sad, because I miss our pets that moved on—especially our hamster, Big Chungus." Our feelings about home are bound to be layered with time. In "Home Is Not Always Happy," Mayra C., grade 4, meditates on the dualities of home. "In the next room is a parent screaming at their kid. and not caring about a thing in life. two kids after being separated for years. also like sour candy that you wish you could spit out." Even when we share a roof with people we love, we carve out our own private homes and may not always feel connected to one another. Home is a mixture of the sweet and the sour. In "The Campfire" by Kristupas R., the narrator finds that home is "...a puzzle with no answer" where "Drips of sadness go on the floor like needles." Still, the narrator concedes, "My world is strange and wonderful." Finding a home in oneself and in one's community can be a lifelong process, and these writers are learning to relish the quest itself. Are you struggling to find a home within yourself? Feeling pulled towards multiple homes? The student ambassadors of the After-School Tutoring and Writing program recommend that "...you should definitely read every story or poem so you have a bigger idea of what home is. We’re happy to be your inspiration, and we hope you take some time to think about all of the different places and feelings and people who are home for you. A good place to start is to ask where you feel safe and loved." 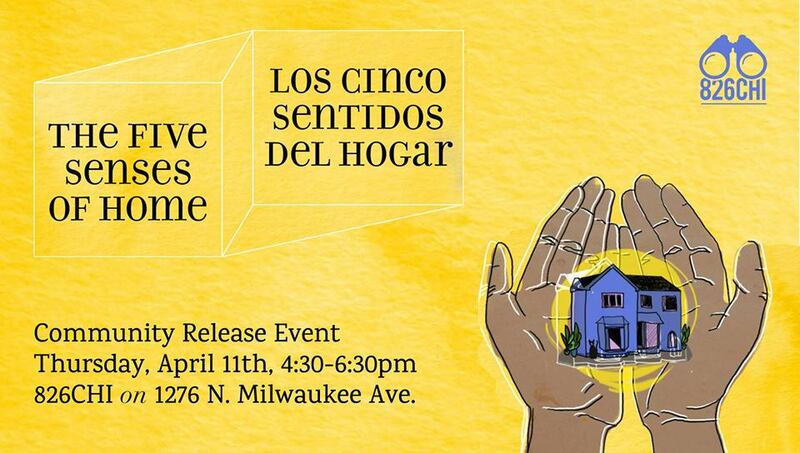 Join us at The Five Senses of Home/Los cinco sentidos de hogar Community Release Event at 826CHI on Thursday, April 11th from 4:30-6:30pm to help these brave authors feel at home during their chapbook reading.